Willow | WHAT A FEELING! 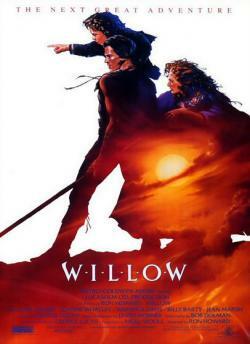 The advance buzz on George Lucas’s Willow has been that the film is “soft”; not quite strong enough, for instance, to open opposite Rambo III and Crocodile Dundee II (a pair of blockbusters that bow next Wednesday). The industry word was the Lucas’s “Star Wars with midgets” was shaping up as a possible summer stiff. Some of this, I think, is wishful thinking from those envious of Lucas’s incredible success. The creator of Star Wars and Indiana Jones doesn’t play by Hollywood’s rules, and he’s taken considerable blame for supposedly lowering the collective IQ of the movie-going public by dishing up his magical fantasies. Willow, it turns out, is neither Lucas’s magnum opus nor his giant stumble. It’s simply an entertaining movie, heavily formulaic but a good bit of fun. Lucas, who takes executive producer and story credit, has fashioned a straightforward fantasia that borrows from himself and others. This is not, regrettably, a major step forward for him, but neither is it a sin. The major inspirational sources are the sword-and-sorcery genre, a la Lord of the Rings, and the Japanese samurai movie. The world of Willow is full of evil queens, talking animals, magical dwarfs, and big two-headed monsters that live in moats. The matter at hand is a baby, an infant princess prophesied to save her kingdom, who needs to be transported away from the evil queen and toward safety. By a complicated set of reasons, the job falls to a farmer named Willow (Warwick Davis), one of the little people who live in a peaceful country. In getting the child away from Queen Bavmorda (Jean Marsh), Willow naturally goes through much adventure, aided along the way by an irresponsible warrior (Val Kilmer), a sorceress who looks like a squirrel, and two rowdy Lilliputian creatures called Brownies, who inexplicably (but amusingly) speak with French accents. The movie is full of the expected high-throttle sequences, including a rather nifty sled chase in the snow, a full-tilt carriage ride, and two (count ’em) castle stormings. (It is also marked by occasionally awe-inspiring special effects, produced by Lucas’s Industrial Light and Magic.) To all of this, director Ron Howard brings his customary good humor; he’s surely responsible for many of the throwaway sight gags and sardonic line readings. Some things seem compromised by their familiarity. Lucas uses what has worked for him in the past, and some sequences correspond exactly to their counterparts in other Lucas films. As do the heroes: Willow is a shorter version of good Luke Skywalker, the pretty princess (Joanne Whalley) is a Princess Leia on the wrong side, and Val Kilmer’s wise-cracking warrior is out of the Han Solo mold. Kilmer has also clearly fashioned his performance—hair, movements, expressions—on Toshiro Mifune, one of the world’s greatest action stars. And the final battle, fought in a driving rain, invites comparison to Akira Kurosawa’s Seven Samurai (Lucas is a longtime Kurosawa admirer), though Willow suffers by the measurement. The question is, does Lucas keep making the same movie because he’s obsessed by similar stories, or because he wants to mine a profitable formula? Either way, and as enjoyable as Willow is, this particular Lucas method seems to have run its course. Haven’t seen it since, but this all sounds about right. How innocently promising the career of Val Kilmer seemed at the time—and Ron Howard’s too, come to think of it. This entry was posted on Friday, February 15th, 2013 at 3:00 am and is filed under 1988. You can follow any responses to this entry through the RSS 2.0 feed. You can leave a response, or trackback from your own site.